If you ever sailed a tall ship or even dreamed of sailing a tall ship, you are probably familiar with Alan Villiers. 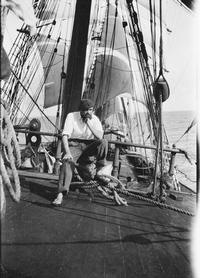 Adventurer, author, photographer, master mariner, ship owner, World War II hero and sail training pioneer, Villiers first stepped aboard a tall ship at the age of 15 and thereafter made his life on the sea. The following videos are titled The Cape Horn Road and if you watch them you will be amazed by the footage and entertained by Villiers’ narration. Not sure where you will find copies of Villiers films but Mystic Seaport webstore offers Irving Johnson’s “Around the Horn in Peking” which has equally dramatic footage. Good luck and let us know if you find a treasure trove of Villiers’ videos. I’m looking to buy the film ‘The Cape Horn Road’ or any other film by him. I’m a sailing ship enthusiast and collect books and build models. I am based in Ireland and finding it difficult to find. Hope someone can help me. Very cool! Tell us more! Well doneshowing the fill, yes the first one smmes as theCrace Haward and the scound one the Joshep Contrad the shi of his own.